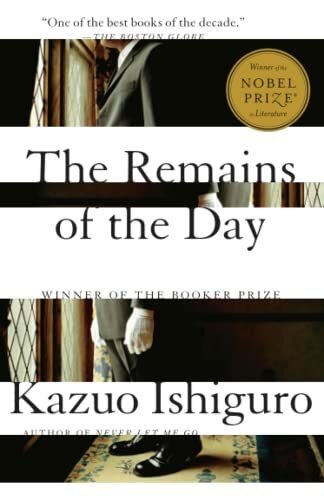 Add Kazuo Ishiguro's The Remains of the Day to the long list of books-I-was-exposed-to-in-my-youth-and-failed-to-appreciate. Not that I read the book back then, but I saw the movie in college and found it rather dull. I wonder now how this book could ever be filmed without being dull; it's mainly one man's mental suppressions. I must see it again and find out. But I now know, having also read Ishiguro's An Artist of the Floating World a couple of years ago, that reminiscence is a powerful tool in this author's hands. In both books, the narrator tells the story of his life in flashback. The narrator in The Remains of the Day is a butler looking back on his years of service to a disastrously foolish nobleman. The narration starts out in a very self-satisfied tone, and as it goes on, the narrator can't help revealing more and more of the reality of events, which is less and less flattering to himself. At the end, we feel that we finally understand the the man's life and choices, and we feel him facing it at last. The revelations are so subtle, so carefully and elegantly revealing, that it's like listening to him mentally unfolding his memories. I have one more book by Kazuo Ishiguro on my shelves--A Pale View of Hills, which also features a narrator recounting memories. I'm very interested to see how like these other two it will turn out to be. Ishiguro is obviously very interested in the phenomenon of memory and how we use it to rewrite our lives. I'm strongly reminded of W. G. Sebald, another writer obsessed with memory. I read his Austerlitz last summer and fell heavily for Mr. Sebald, more of whose work I also want to read. I just read about memory today....looking up info about Juan Luis Vives ( 1493 - 1540). I was amazed how inciteful this man was for his times. Memory ( according to Vives) can be improved with practice. He advises, One should memorize something every day, even a useless quotation. I try to memorize French words A-Z that I have read before going to sleep! I never get passed 'M"! I was curious if you did some 'google-ing" about Ishiguro to discover where this facination about memory stems from! I haven't googled Ishiguro; it's just that both books of his that I've read have consisted of a narrator recounting his memories and revealing himself in the process. And the third one, which I've just started, is looking like it will be that way too. So I'm inferring that memory is very important to him.